The band's music, focused on death, dying and suicide, generates a cult following. Band member Gina Virelli, a.k.a. Bertha Beirut (Diana Karanikas), has a teenage sister, Brooke (Ilene B. Singer), who, along with half a dozen friends, slices her wrist, as per the lyrics of a Dead Girls song. Brooke ends up being the sole survivor of the group suicide. This causes the band, which also includes drummer (Steven Kyle); Suzie Striker (Angela Scaglione); Nancy Napalm, a.k.a. Amy (Kay Schaber); and Dana (Angela Eads), to question their death gimmick and postpone all gigs for a two-week retreat at a cabin in the woods. Gina insists on bringing Brooke, who is comatose from her failed suicide attempt, and her personal nurse (Dierdre West). When the band, arrive at the cabin (which happens to have a mentally challenged, hulking caretaker, Elmo [David Williams]), a string of murders start with the first victim being an obsessed groupie in torn jeans, biker leathers and a black wig, who followed the band. Each murder is inspired by a different Dead Girls song. 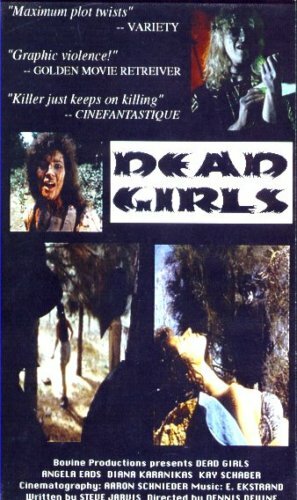 Directed by Dennis Devine, Dead Girls was released by defunct Rae Don Home Video.